You are here: HomenextTransportnextTransport - shipsnextASPILOS in Tilbury. 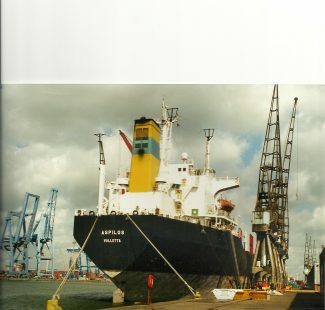 The bulk carrier ASPELOS in Tilbury registered in Valletta. More info RWJ. ASPILOS was built in 1982 as WORLD HARVEST for a Greek outfit. It was sold in 1985 and took on the name GREAT HARVEST, and became ASPILOS in October 1984 when sold to Aspilos Shipping Co Ltd, of Malta, and managed by Dileship Marine Corp, of Piraeus, Greece. The 22,182 tons gross, 37,600 deadweight, bulk carrier was sold in July 2009 to AK Shipmanagement & Services, of Chittagong, Bangladesh, and was renamed RAMSI under the flag of St Vincent. Not sure of its present status. Although it is owned in Chittagong, it arrived at that port on 5 May this year from Kosichang, from where it was underway at an average speed of 8.8 knots. It was obviously in no hurry to get to Chittagong, and as that is also a major shipbreaking port, it is possible that she is destined for a local scrapyard.